Free Ariel the Little Mermaid coloring pages to print for kids. Download, print and color! 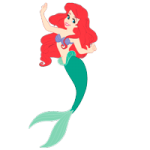 Ariel the Little Mermaid coloring pages are created on the ground of the animated movie adored by the majority of girls at the age from 3 to 10 years old. The images with scenes from the romantic love story of the beautiful little mermaid and prince Eric will be a great present for your little girl. You as well can print Ariel the Little Mermaid coloring pages from our website and offer your kid to meet again with pompous and at the same time funny crab Sebastian, the malicious witch and goggle-eyed fish Flounder, laugher Pearl, king Triton and other dwellers of the underwater world. Instructive stories from the life of the little fidget dared to neglect the advice of her elders will help your girl to understand how important it is to listen to her parents and to follow their advice.